Like every year, IWC has prepared a main theme for its show at the Salon International de la Haute Horlogerie (SIHH) exhibition (Geneva, 14-17 January 2019). 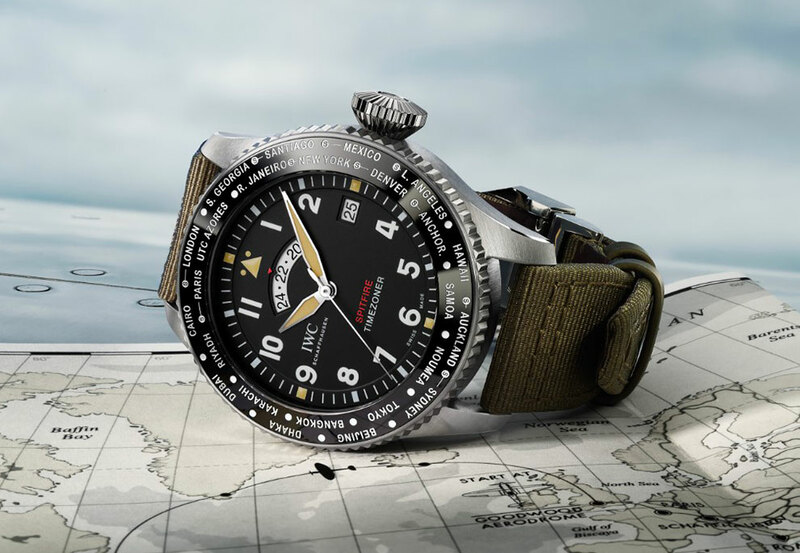 At the heart of SIHH 2019, the Schaffhausen brand will be showcasing its Pilot’s Watches, including a new Spitfire line, a new Top Gun line and "Le Petit Prince" special editions. Today we are unveiling two new Spitfire models. Other new IWC models will be presented in the coming days. 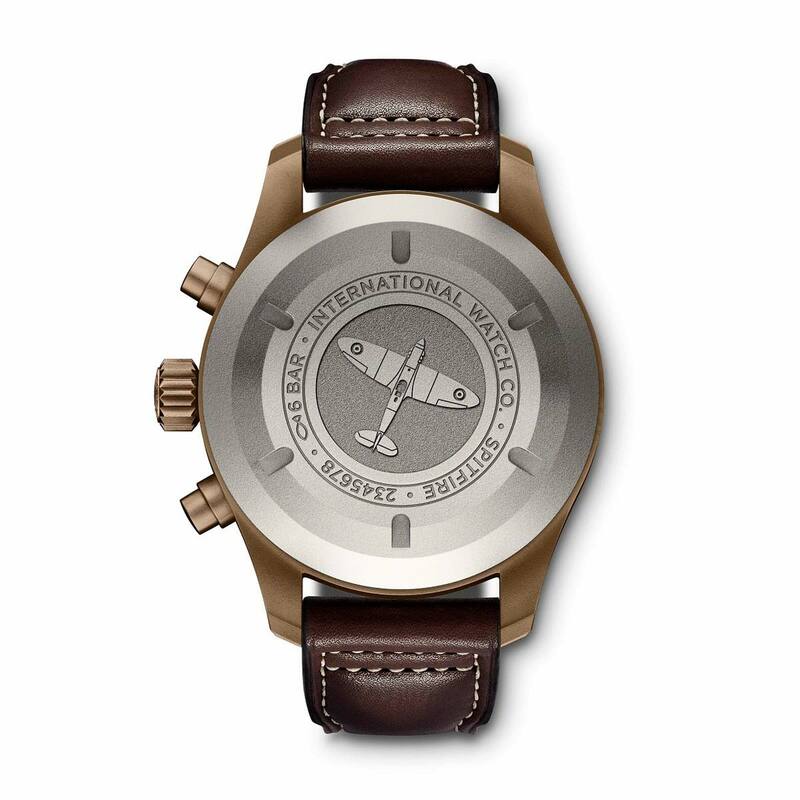 Dedicated to one of the most legendary British fighter aircraft of World War II and a great example of functional design, the Spitfire collection was designed taking inspiration from the iconic Mark 11 navigation watch. 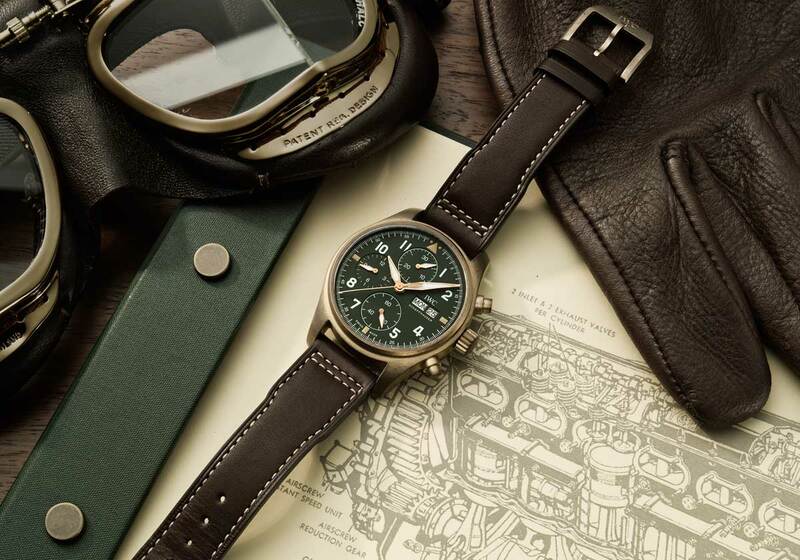 The new IWC Pilot’s Watch Chronograph Spitfire (ref. IW387902) comes in a reduced case diameter of just 41 mm which houses a movement from the 69000 calibre family, introduced in 2016 and one of the most important developments in IWC-manufactured movements in IWC's recent history. This is the first time that IWC integrates a member of this calibre family into its Pilot’s Watches. Characterized by a classic column wheel design, the 69380 chronograph movement displays chronograph hours and minutes on two subdials at 9 o'clock and 12 o'clock while also featuring a date and day display. Beating at a frequency of 4 Hz, it guarantees a power reserve of 46 hours. The movement is protected by a soft-iron case for protection against magnetic fields. 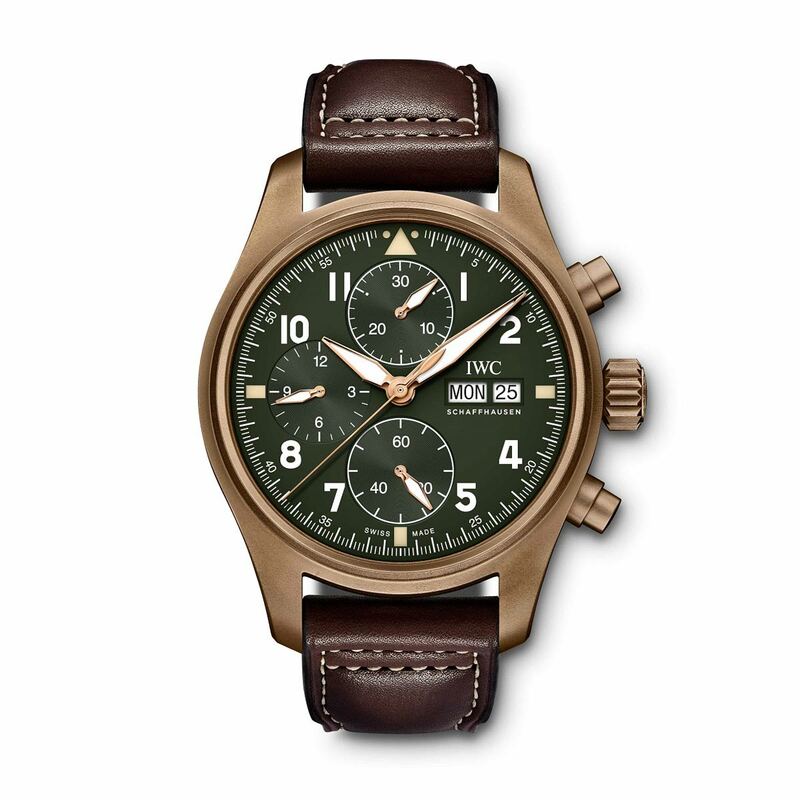 The bronze case, the olive green dial and the brown calf leather strap give this chronograph a unique character. Bronze has many lovers for its characteristic of developing a special patina over time, making each and every watch a unique piece. 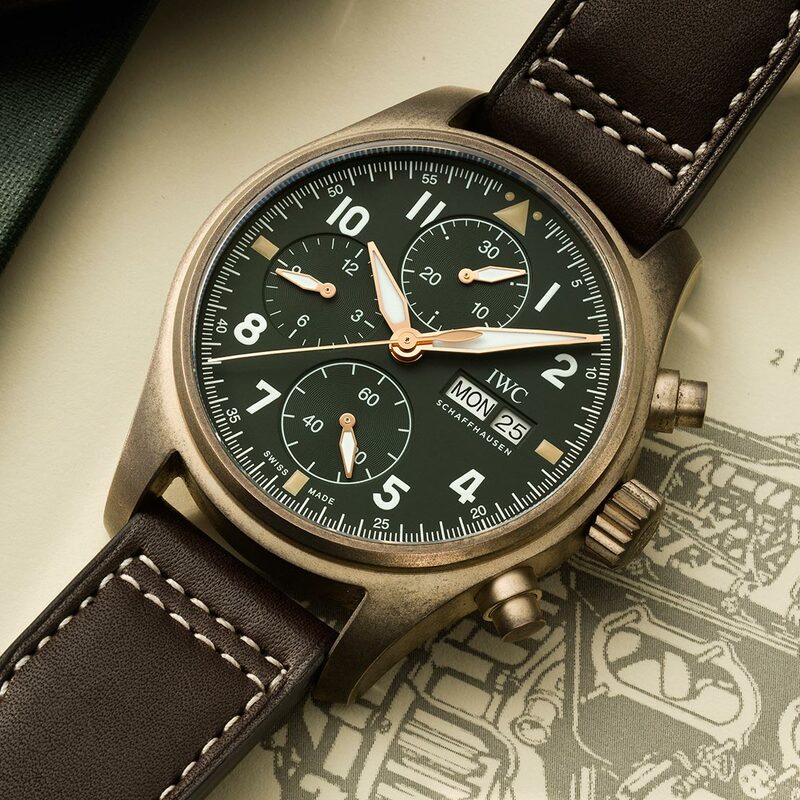 The IWC Pilot’s Watch Chronograph Spitfire is water resistant to 6 bar and has an indicative price — the official price will be announced at SIHH 2019 — of Euro 7,050. 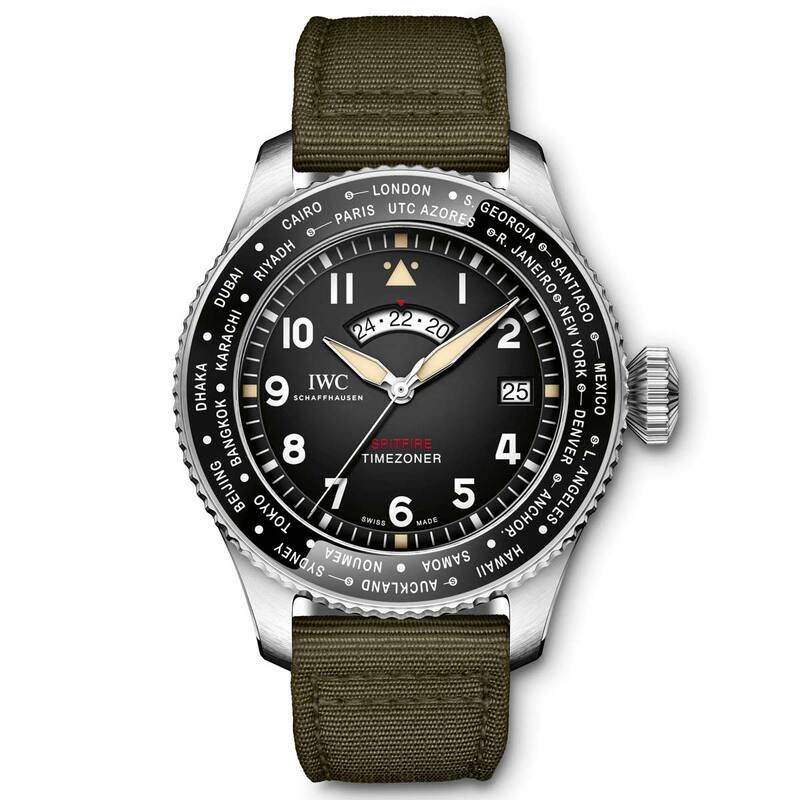 The IWC Pilot’s Watch Timezoner Spitfire Edition "The Longest Flight" (ref. IW395501) combines the patented Timezoner mechanism with an entirely automatic IWC-manufactured movement and is limited to just 250 watches. 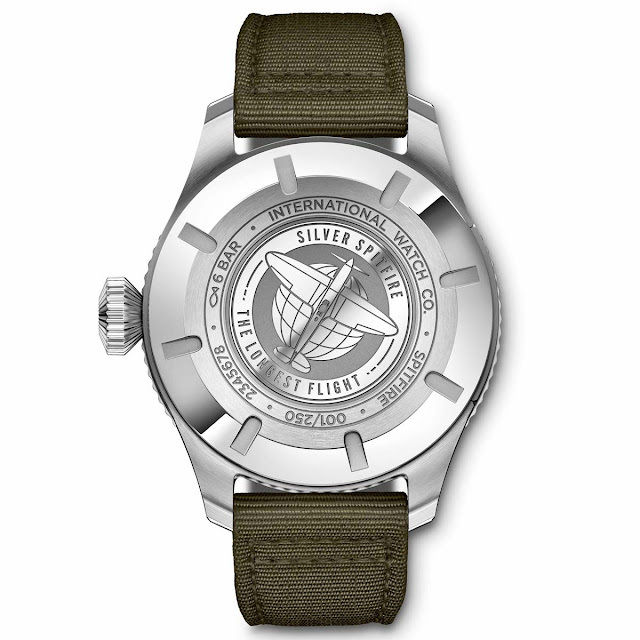 This special edition is dedicated to the "Silver Spitfire – The Longest Flight" project. It has been specially developed for pilots Steve Boultbee Brooks and Matt Jones to coincide with their flight around the world in a Spitfire. In fact, the colour scheme of the watch, with its imposing 46 mm stainless steel case, its black dial and its green textile strap, is somehow reminiscent of the cockpit of a Spitfire. The watch can be easily set to a different time zone by means of a simple rotational movement of the bezel. The hour hand, the 24-hour display and the date rotate automatically at the same time. The 24-hour display has been designed as a rotating disc beneath the dial. This means that the dial moves closer to the front glass, making it easier to read. The watch is water resistant up to a pressure of 6 bar and features a sapphire glass secured against displacement by drops in air pressure. The new 82760 IWC-manufactured calibre is equipped with a Pellaton winding mechanism with components made from wear-resistant ceramic. It offers a a power reserve of 60 hours. Indicative price: Euro 14,100. Like the bronze model and its reduced size. Curious to wear it and see how it looks on my small wrist.